While watching one of the Andy Griffith shows recently, I noticed the dress that Aunt Bea was wearing. That style was quite popular at the time. It was some kind of "Stroller". Was it a Shelton Stroller? The style looked like it had a jacket that matched but I'm thinking all was sewn together maybe. Went along with the era of the clunky Miller shoes and probably a lace-up corset as well. The well-dressed woman! Here's another big fan on Andy Griffith... a North Carolina guy! I love the whole gang; Andy, Aunt Bea, Opie, Floyd, and even Barnie!! It's fun to watch those vintage shows and see how things have changed, some for the better, (no corsets) and some not (pjs out in public). We went to a museum yesterday that had reproductions of a couple of Scarlett O'Hara's dresses and some of the undergarments for the costumes and one of the hats that was in the movie. Fun. Glad we don't have to dress like that! My grandma dressed like that when she dressed up. I love watching old shows and movies and looking at the fashions and home decor. Were corsets still used in Mayberry time? i thoguht they wre gone long before it. My GF made and wears one when we do 1860s events. When in high school, we pinned bra straps to our shirts - Heaven Forbid anyone would see them ! 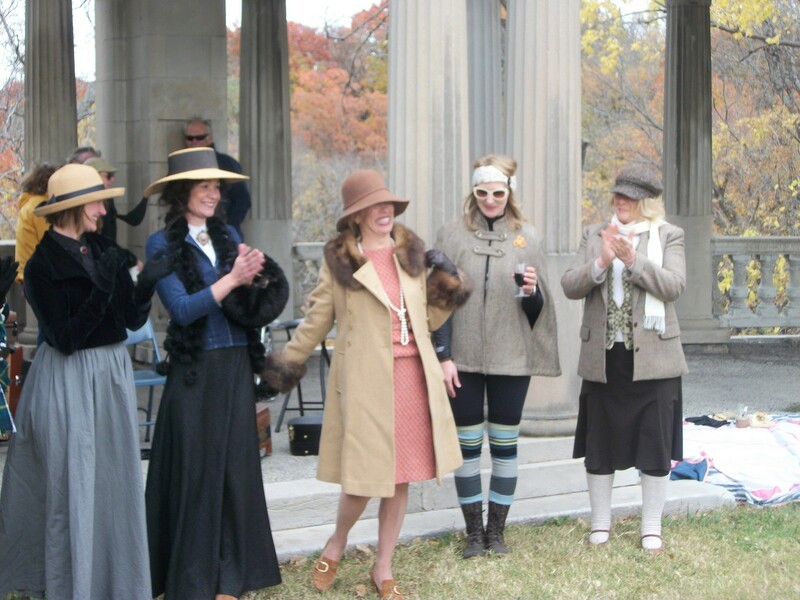 In those days, old ladies dressed like, well, old ladies. My grandma wore old lady dresses, old lady shoes, and old lady hats. I am 62 now and thank heavens those days are Over!! We love the Andy Griffith show and all the regulars. We watch everyday of the week. Love MASH also. I love those old shows...i am 77 and although I don't dress like an old lady I do dress my age. I do have problems with my legs so I can't wear very high heels..only 2" heels when I dress up. I also watch Matlock, Colombo and Perry Mason. How do you know what is appropriate for your age? Do you look to TV or magazines, or those internet ticklers that promise to tell you what to wear at age 30, 40, 50? No one ever tells 70 and 80 year olds what to wear in those articles. I guess they think we quit caring/living after 50. Well we may still care but believe me no one else does. I'm with most of you; LOVE the oldies. I love the old musicals where the guys wore suits and the ladies wore gorgeous chiffon flowing dresses. I do NOT like dancing with the stars. The women wear outfits that look like they should be trolling the 'streets' - if you get my drift. Just trashy looking; boy am I/we showing our ages or what! I can say the exact same thing about my DH and I. We're watching more M.A.S.H. Than Andy Griffith lately, but these shows are just timeless. An especially good alternative to all the reality TV or political stuff. I also like Designing Women. Julia, Suzanne, Charlene, Mary Jo Anthony and Bernice were ALL hoots! I have been watching Roy Rogers, Perry Mason, and the love of my life when I was five -- The Lone Ranger. I had no idea, until recently that he was played by two different men, but my favorite was Clayton Moore. We went to a museum yesterday that had reproductions of a couple of Scarlett O'Hara's dresses and some of the undergarments for the costumes and one of the hats that was in the movie. Fun. Glad we don't have to dress like that! There is a museum in the old Vicksburg Courthouse that I love. One big room has clothes from the civil war... dresses and uniforms and children's clothes. One thing that really strikes you is how small all of the clothing was. Even the men's uniforms look like they would only fit young teen boys these days. People were certainly a lot smaller then. Probably indicative of the food content and supply available. No one ever tells 70 and 80 year olds what to wear in those articles. I guess they think we quit caring/living after 50. LOL, OBO!! So funny but true! I do NOT like dancing with the stars. The women wear outfits that look like they should be trolling the 'streets' - if you get my drift. Just trashy looking; boy am I/we showing our ages or what! We watched the movie "Hoosiers" the other night, which took place in the late 50's, I think. I was really impressed with the cheerleaders' uniforms. They all wore big sweaters, skirts down to their calves, and saddle shoes. The were covered and still could cheer! Thanks to the Dallas Cowboys cheerleaders, all the colleges and schools now barely dress their cheerleaders at all. It's a total skin show, nothing to do with the team or school spirit. Well, one thing! When we watch the old shows, we don't have to listen to all the cursing, and worse bad language. It is so bad now, that we can not watch new shows. Mayberry time? I used to love watching that show and wished I'd had an Aunt Bee who would love me. Now a days her voice would drive me crazy. don't know why. my ears I guess. they did dress the ladies on that show well. Oh there was only One Roy Rogers, like One Tarzan. always the first!! I like to go on Tweed Rides with bicycles. Folks dress for style not speed. Elegence over exertion and picnic lunches from wicker baskets afterwards. They are held internationally. Many in the U.K. My jacket wasn't ready so I grabbed one that was too short. GF made all her garb. old pic. She is minus 100 lbs now and modified all garb. some folks still go to balls. 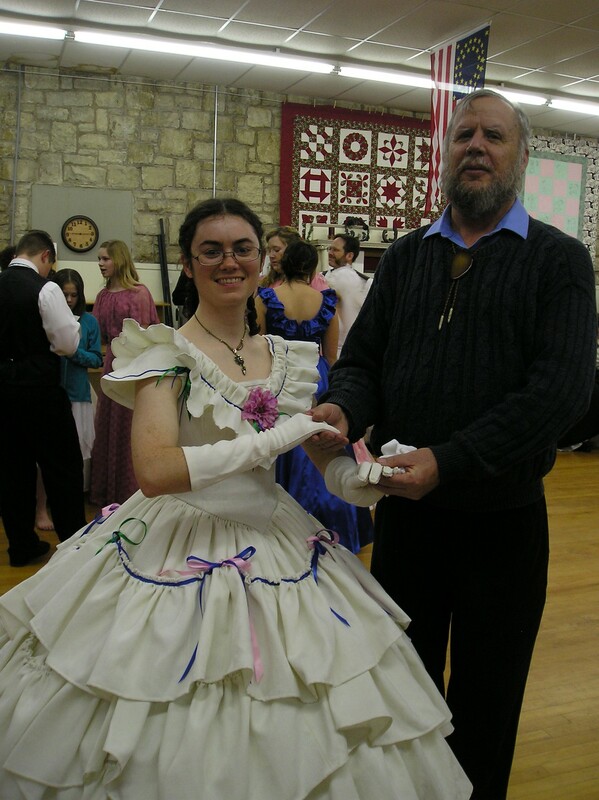 This young lady hand stitched her dress and made the corset under it. It sure felt funny when I gave her a swing and felt strong fabric over her sides. What a fun life you lead, leonf! Aunt Bea wasn't really anything like she looked on Mayberry. She didn't like children. Stayed in her trailer most of the time during shootings, when she wasn't needed. The rest of them all were like a family. I am friends with a child actor (my age, now) who played one of Opie's friends on the show, Johnny Paul Jason. (He was also Little Ricky on I Love Lucy.) He said Frances Bouvier (Aunt Bea) was really mean. Funny how we can get fooled by.... "ACTING!" That looks like one fun Ball. What a beautiful young woman in such a lovely gown. She was a park guide for a pony express station here in KS. One day a fellow on a cross country drive needed to walk a bit, Since he had an interest in history, he stopped at the station. His 300 minute break took 2 hours and then a supper. They are now married and thier second child is on the way. Her mom teaches corset making, She rides a unicycle, plays violin and can butcher her own meat. 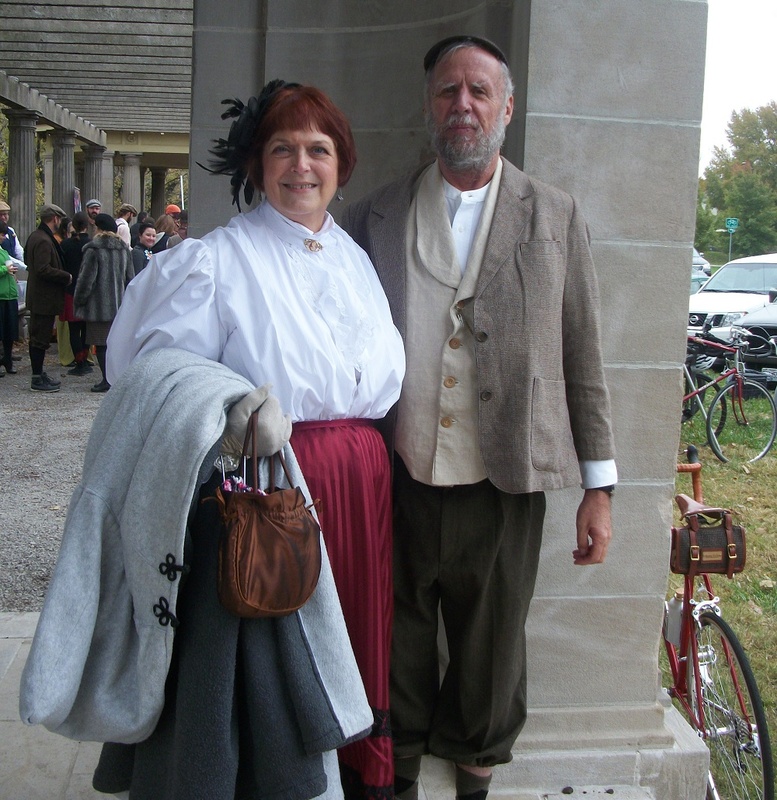 We gave them a red eye treadle for their wedding.